Needless to say, if you enjoy other similar anime dressup games I’ve reviewed here such as Hello Nikki, CocoPpaPlay, Romantic Diary, Pokemini / Pokecolo or Miitomo then you will also enjoy Line Play, so let’s take a closer look below! Geeky: 3/5 – Although it is saccharine overload at times, if you’re not opposed to a “cutesy” game, then Line Play actually has a ton of features and is more robust and in depth than a lot of other anime dressup games. There are also a lot of skill-based minigames which provide a fun challenge and way to earn in-game currency. It does however sometimes suffer connection issues or lag which is why I can’t rate it higher. Sweetie: 5/5 – This game oozes charm and cuteness at every corner. 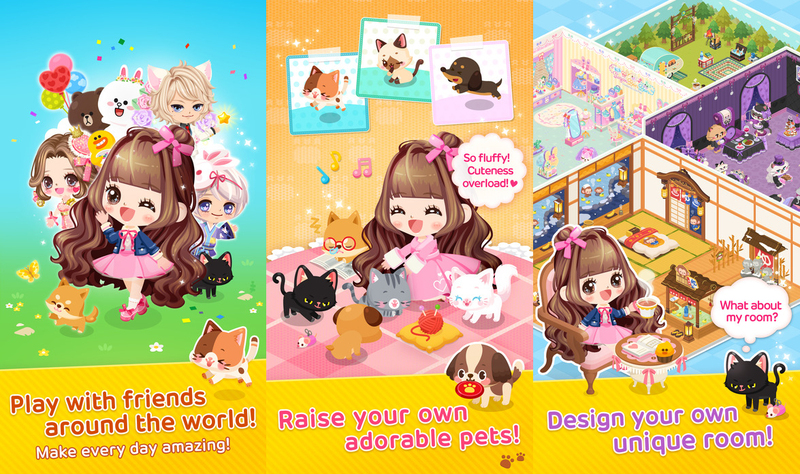 It also partners with big-brand names you know and love such as Hello Kitty, Sailor Moon, Disney, and Show by Rock, as well as offering tons of options to customize your avatar, your room, even raising cute pets! It also has a journal system and chat rooms making it almost a social network as much as it’s also a game. Concept: 10/10 – I’ve mentioned it a few times, but this game has just a ton of things to do! You can go fishing, you can raise a pet, you can play skill-based minigames, you can dressup your avatar as well as decorate your room by layering different items from thousands if not millions of combinations. The social networking aspects are also a great way to make friends, or play together with your real life friends. There are multiple worlds you can explore and lots of new things to see and do which get added regularly with new updates. Gameplay: 8/10 Although there is a lot to do in this game, it does become tedious and repetitive after long periods of play. The game also suffers from occasional lag or connectivity issues. However, those two small flaws aside, this game is a lot of fun. You get to interact with other players which makes the game world feel very immersive and alive. You can choose to play various minigames which require speed, skill, and a bit of luck. You can go fishing, explore multiple different themed worlds where you can chat or roleplay with your friends, or just spend hours alone in your room decorating your home, playing with your pet, writing in your journal, or trying on new outfits. Story: 2/10 – I thought about giving story a zero to be honest, but then I remembered that there are occasional events which present a story in comic book form (similar to Gaia Online, actually almost everything about this game is very much like Gaia Online). These stories are cute and short, sometimes continued through multiple-part events. But ultimately, there really is no true overarching story of any kind. Graphics: 10/10 – This game is just so cute. The game is in 2D isometric top-down view reminiscent of many retro or anime-styled games. There is a lot of work put into the sheer amount of graphics needed to create this game. Really no two avatars ever look alike thanks to hundreds of thousands of different items. Items get removed and added in almost daily. When you first start the game, you can select to either be a human or furrie. This setting cannot be changed later, and both races have access to different face items. You customize everything about yourself, from your hair, to your shoes, to your eyes, nose, lips, shirt or dress, and then you can choose different accessories to accent your outfit. You also can decorate and expand your room. You can invite your friends over to party together in your room or go see your friends’ rooms too. There are also many open world areas for you to go explore each with a different cute theme! The user interface is also clean and intuitive. Music: 5/10 – It’s cute at first, but gets old very quickly. Also I found some of the minigame music and sound effects to get distracting at times. There are lots of cute sound effects when fishing or playing with your friends. However, the main theme song gets used so often and in so many different areas of the world, that you will grow tired of it after a few hours max. Community: 7/10 – Most of the people I’ve met in Line Play have been very nice and friendly; however, for being a social network, it seems most people are not that social. It’s probably more fun if you already have a group of friends to play with. However, there are several different chat rooms as well as the ability to chat in the open world areas, the journal system (where friends can leave a comment), and the ability to import friends from popular social networks such as Line and Facebook. It also features private messaging, group chats, or the ability to invite friends to see your room, or meet new ones in any of the open world areas. Friends can also help you out in various minigames or by sending you a “heart”. Once you get over that initial hurdle of making a few friends, Line Play definitely provides you all the tools you need to continue to foster that friendship. Since the game features kawaii graphics, many of the players in Line Play share common interests such as anime and games which can help when making new friends especially if you’re shy or introverted. On the other hand, because of the cute and simplistic nature of the game, the Line Play community also has many young children and teens and not very many active players who are over 30, such as myself, which can make it awkward or difficult to make new friends as well. Replay Value: 10/10 Thanks to a wide variety of minigames and different activities to enjoy, as well as frequently updated content, limited events, and the drive to collect new and rare items for your home and avatar, this game keeps you coming back to see what’s new or to chat with your friends.